CWS Fiberglass Technology offers superior fiberglass products with the fabrication and installation of FRP/GRE pipe and fittings. CWS works closely with the largest FRP suppliers in Western Canada — giving us access to specialty materials and preventing long lead times on material procurement. Excellent corrosion resistance is a major advantage over metallic materials. The corrosion of metallic materials costs the petroleum industry hundreds of millions of dollars each year. 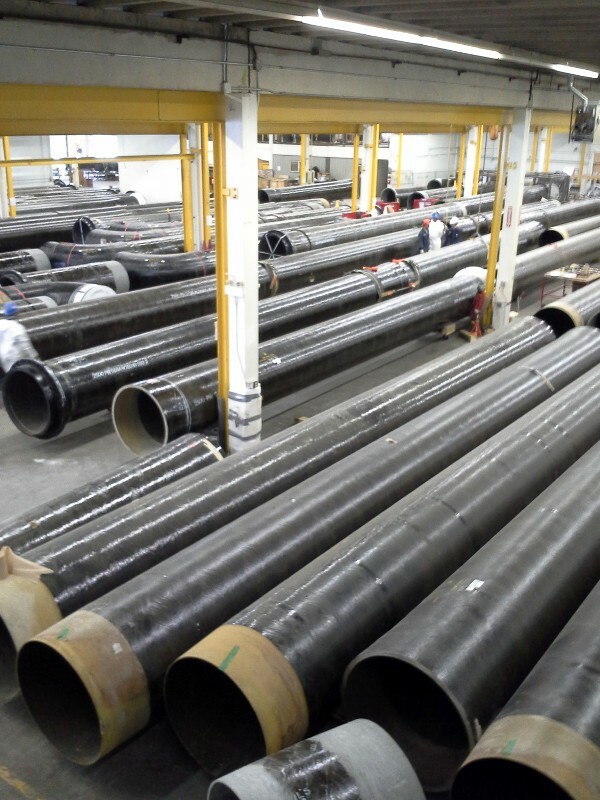 Quality fiberglass piping systems will outlast and outperform protected steel, black iron, copper, and stainless steel. Fiberglass-reinforced piping can handle temperatures of up to 134°C/275°F. Due to the physical properties of FRP products, you will benefit from rapid installation and a reduced labor cost and material-handling cost. Significant savings and reduced project turn-around time are realized as a result of using FRP products. CWS Fiberglass Technology has compiled a list of commonly requested documentation for the benefit of our clients. Should you have any questions or concerns regarding these products, please feel free to contact one of our highly qualified staff. Red thread 16 & 25 bar piping has been used extensively with great success for petroleum production applications, such as saltwater handling, CO2, crude oil and gas, food processing services, water and wastewater facilities, HVAC, and chemical-processing services. It is an unlined, filament-wound product ideal for light chemical services in salts, solvents, and pH 2 - 13 solutions that corrode traditional metal pipe. The bell and spigot joining system is ideal for close tolerance piping. The T.A.B. (Threaded and Bonded) joints offer quick installation for long piping runs. Green thread filament-wound piping is an excellent choice for applications, such as dilute acid, caustic applications, produced water, industrial waste, hot water, and condensate return. Carries NSF Standard 61 for potable water service. The bell and spigot connection offers quick installation and is ideal for close tolerance piping. Centricast RB-1520 and Centricast Plus RB-2530 pipe are manufactured from high-strength glass fabrics, highly resilient aromatic amine epoxy resin, and feature a barrier of pure resin for excellent corrosion resistance. Bondstrand 2400 filament-wound piping, aromatic amine cured epoxy. Joining method taper/taper adhesive bonded or key-lock mechanical joint. Recommended for saltwater, brackish water, fire protection, potable/wastewater and sewage, oil field reinjection, crude oil transmission, and mild chemicals. ATS Inc. produces fiberglass duct and fiberglass pipe for use in industries, including semiconductor fume exhaust, uranium extraction, pharmaceutical, wastewater treatment, silicon water, solar cell, picture tube, and flat-panel industries. While ATS offers a wide array of products to meet your needs, they specialize in producing fire-safe duct. ATS Inc. has been serving the semiconductor industry since 1978.